Upon registration new users will be offered a COMPLIMENTARY SUBSCRIPTION (Free Trial) until further notice. 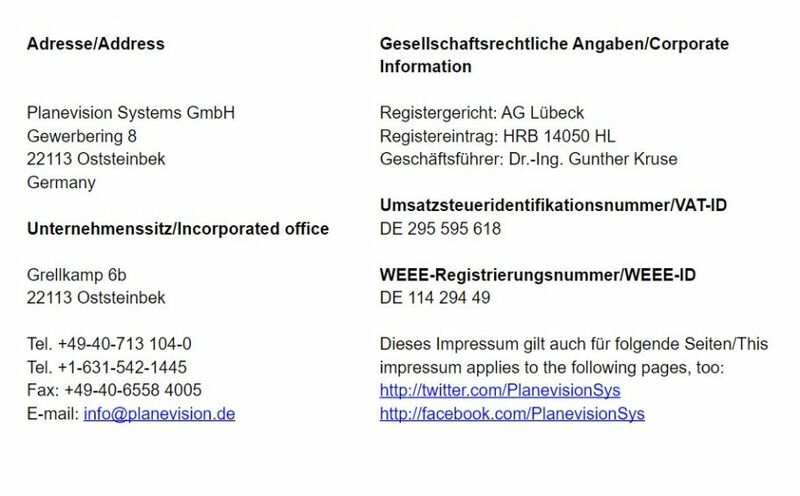 Planevision Systems GmbH (“Provider”) will provide you access to the Web Services (as defined below) and related website located at https://planevision.systems and https://adsb24.com or such other web addresses or uniform resource locators as may be specified by the Provider (collectively, the "Site"), specifically and solely for the purposes of requesting and receiving Data (defined below), Third Party Data (defined below), and services under the related Service Plan (defined below). YOU ACKNOWLEDGE AND AGREE THAT, BY ACCESSING OR USING THE SITE, WEB SERVICES, DATA OR THIRD PARTY DATA, YOU ARE INDICATING THAT YOU HAVE READ, UNDERSTOOD AND AGREED TO BE BOUND BY THIS AGREEMENT. IF YOU DO NOT AGREE TO THIS AGREEMENT, THEN YOU HAVE NO RIGHT TO ACCESS OR USE THE SITE, WEB SERVICES, DATA OR THIRD PARTY DATA. If you accept or agree to this Agreement on behalf of a company or other legal entity, you represent and warrant that you have the authority to bind that company or other legal entity to this Agreement and, in such event; “Customer”, “You” and “Your” will refer and apply to that company or other legal entity. “Web Services” consist of a set of software programs, interfaces, and web pages running on computers hosted at Provider sites or at third-party hosting facilities accessible via the Internet as described in this Agreement and the Site. “Data” means the data that is (i) owned by Provider and (ii) obtained by Provider from its own or other sources delivered to Customer via the Web Services and as described in this Agreement and on the Site. “Third Party Data” means the data that is (i) not owned by Provider and (ii) obtained by Provider from its own or other sources delivered to Customer via the Web Services and as described in this Agreement and on the Site. “Data Owner” means a legal entity that holds ownership rights to some of the Data or Third Party Data and is the original licensing source of such portion of the Data or Third Party Data when such portion of the Data or Third Party Data is not in the public domain. “Service Plan” means the Complimentary Service Plan of the use of the Web Services, Data, and Third Party Data. The Provider posts the available Service Plans and specific service levels provided by each Service Plan on the Site, as they may be updated by the Provider from time to time. Provider reserves the right to modify, discontinue or terminate the Site, Web Services, Data and Third Party Data or to modify this Agreement, at any time and without prior notice. If Provider modifies this Agreement, Provider will post the modification on the Site. By continuing to access or use the Site, Web Services, Data and Third Party Data after Provider has posted a modification on the Site you are indicating that you agree to be bound by the modified Agreement. If the modified Agreement is not acceptable to You, Your only recourse is to cease using the Site, Web Services, Data and Third Party Data. In order to access the Site, Web Services, Data and Third Party Data, You must register to create an account (“Account”). During the registration process You will be required to provide certain information and You will establish a password. You agree to provide accurate, current and complete information during the registration process and to update such information to keep it accurate, current and complete. Provider reserves the right to suspend or terminate Your Account if any information provided during the registration process or thereafter proves to be inaccurate, not current or incomplete. You are responsible for safeguarding Your login/password. You agree not to disclose Your login/password to any third party and to take sole responsibility for any activities or actions under Your Account, whether or not You have authorized such activities or actions. You will immediately notify Provider of any unauthorized use of Your Account. Upon registration to use the Site, Web Services, Data and Third Party Data, the Provider will provide a temporary free trial of the Site, Web Services, Data and Third Party Data the "Free Trial". ANY RESTRICTIONS OF THE FREE TRIAL ARE DETERMINED SOLELY AT THE DISCRETION OF THE PROVIDER AND MAY BE MODIFIED AT ANY TIME. THE FREE TRIAL IS PROVIDED ONCE AND ONLY UPON YOUR FIRST REGISTRATION AT THE SITE. THE FREE TRIAL MAY NOT BE PROVIDED UPON SUBSQUENT REGISTRATION BY CUSTOMER OR CUSTOMER’S AGENTS OR AFFILIATES. Web Services License. Subject to Customer’s compliance with the terms and conditions of this Agreement, Provider grants to Customer a limited, non-exclusive, non-transferable, license to access and use the Web Services, Data and Third Party Data solely for its own personal purposes. This Agreement governs Customer’s access to and use of the Web Services and the Site. Customer acknowledges and agrees that but for this Agreement, Customer would have no rights or access to the Web Services and the Site. Proprietary Rights. Subject to the limited rights expressly granted hereunder, Customer acknowledges that the Data, Third Party Data, Web Services, Site, and/or any developments to the Data, Third Party Data, Web Services, and Site that result from services provided under the Service Plan provided to Customer hereunder are proprietary in nature and owned exclusively by Provider and/or the Data Owners. The Data, Third Party Data, the Web Services, as well as the Developments are to be used exclusively as described herein. Restrictions on the Web Services. Customer may not use, adapt, modify, redistribute, sublicense, sell or otherwise make available any portion of the Web Services, Data or Third Party Data for use by software applications not owned or licensed by Customer or in any Data Exchange Format to other individuals or companies or third parties, including but not limited to, vendors, contractors, partners and the general public (e.g., public websites, partner and vendor extranets, EDI applications, etc.). Enforcement. Except as otherwise provided herein, Customer is responsible for all of Customer’s activities occurring through its use of the Web Services. Term. This Agreement will commence when You are accepted for the Free Trial. This Agreement shall continue from the Start Date through the End Date specified by the respective Service Plan (the “Term”) unless it is renewed. Right to Terminate. Either party may terminate this Agreement at any time during the Free Trial. After the Start Date either Party may terminate this Agreement for any reason during the Term by delivering written or electronic notice of termination at least thirty (30) days prior to end of the Term. Notwithstanding the foregoing either party may terminate this Agreement at any time in the event that the other party breaches any material term of this Agreement. Indemnification by Customer. Customer agrees to defend (or settle), indemnify and hold Provider, its employees, directors and officers harmless from and against any and all liabilities, losses, damages, or expenses (including court costs and reasonable attorneys fees) in connection with any third party claim that the Customer’s use of the Web Services or Data in violation of this Agreement infringes or misappropriates any Intellectual Property Rights of any third party, provided that Provider does not make any admission of Customer guilt without Customer’s prior written approval and provided that Provider gives Customer (i) prompt written notification of the claim or action, (ii) sole control and authority over the defense or settlement thereof, and (iii) all reasonably available information, assistance and authority to settle and/or defend any such claim or action. Warranty Disclaimers. OTHER THAN SPECIFICALLY SET FORTH HEREIN, (i) THE WEB SERVICES, SITE, DATA, AND THIRD PARTY DATA ARE DELIVERED TO CUSTOMER ON AN “AS IS” BASIS, WITHOUT ANY WARRANTIES OR REPRESENTATIONS, EXPRESS OR IMPLIED, INCLUDING, WITHOUT LIMITATION, WARRANTIES OF MERCHANTABILITY, ACCURACY OF INFORMATION PROVIDED, NON-INFRINGEMENT, OR FITNESS FOR A PARTICULAR PURPOSE, QUALITY, OR PERFORMANCE, (ii) PROVIDER MAKES NO WARRANTY THAT THE SITE, DATA, OR THIRD PARTY DATA WILL MEET CUSTOMER'S SPECIFIC OBJECTIVES OR NEEDS; (iii) PROVIDER MAKES NO WARRANTY THAT THE WEB SERVICES, SITE, DATA, OR THIRD PARTY DATA WILL BE FREE FROM ERRORS OR BUGS; and (iv) PROVIDER MAKES NO WARRANTY THAT THERE WILL BE UNINTERRUPTED OPERATION OF THE WEB SERVICES, SITE, DATA, AND THIRD PARTY DATA. CUSTOMER ACKNOWLEDGES THAT (i) ANY DATA DOWNLOADED THROUGH THE USE OF THE WEB SERVICES AND SITE IS DONE AT ITS OWN DISCRETION AND RISK, AND THAT CUSTOMER WILL BE SOLELY RESPONSIBLE FOR ANY DAMAGE TO ITS COMPUTER SYSTEM OR LOSS OF APPLICATIONS OR DATA THAT RESULTS FROM THE DOWNLOAD OF SUCH DATA and (ii) THE FOREGOING EXCLUSIONS AND DISCLAIMERS OF WARRANTIES ARE AN ESSENTIAL PART OF THIS AGREEMENT AND FORMED THE BASIS FOR DETERMINING THE PRICE CHARGED FOR THE PRODUCTS. NO ADVICE OR INFORMATION, WHETHER ORAL OR WRITTEN, OBTAINED FROM PROVIDER OR ELSEWHERE SHALL CREATE ANY WARRANTY NOT EXPRESSLY STATED IN THIS AGREEMENT. SOME JURISDICTIONS DO NOT ALLOW THE EXCLUSION OF CERTAIN WARRANTIES IN CERTAIN CIRCUMSTANCES. ACCORDINGLY, SOME OF THE LIMITATIONS SET FORTH ABOVE MAY NOT APPLY. Accuracy of Data and Third Party Data. PROVIDER MAKES NO WARRANTY REGARDING THE DATA, THIRD PARTY DATA OR ANY OTHER INFORMATION PURCHASED OR OBTAINED THROUGH PROVIDER’S SITE AND/OR THE WEB SERVICES, OR THE ACCURACY, TIMELINESS, TRUTHFULNESS, COMPLETENESS OR RELIABILITY OF ANY DATA, THIRD PARTY DATA OR OTHER INFORMATION OBTAINED THROUGH PROVIDER’S WEBSITE AND/OR THE WEB SERVICES. Limitation of Liability. UNLESS OTHERWISE PROVIDED HEREIN, IN NO EVENT WILL PROVIDER’S AGGREGATE LIABILITY TO CUSTOMER AND ANY THIRD PARTY IN CONNECTION WITH THIS AGREEMENT OR CUSTOMER’S ACCESS TO OR USE OF THE WEB SERVICES EXCEED THREE (3) MONTHS PRORATED SUBSCRIPTION FEES, REGARDLESS OF THE FORM OR THEORY OF THE CLAIM OR ACTION. PROVIDER WILL NOT BE LIABLE FOR ANY INDIRECT, CONSEQUENTIAL, SPECIAL, PUNITIVE, EXEMPLARY OR RELIANCE DAMAGES ARISING OUT OF OR IN CONNECTION WITH THIS AGREEMENT, OR ANY DAMAGES RESULTING FROM ANY INTERRUPTION OR DISRUPTION IN COMMUNICATIONS OR SERVICES, UNAVAILABILITY OR INOPERABILITY OF SERVICES, TECHNICAL MALFUNCTION, LOST DATA, OR LOST PROFITS, EVEN IF PROVIDER KNEW OR SHOULD HAVE KNOWN OF THE POSSIBILTY OF OR COULD HAVE REASONABLY PREVENTED SUCH DAMAGES, AND NOTWITHSTANDING THE FAILURE OF ESSENTIAL PURPOSE OF ANY LIMITED REMEDY. Compliance with Laws and Policies. The parties hereby agree to abide by and comply with all applicable local, state, national, and international laws and regulations (including applicable laws that pertain to the transmission of technical data, privacy, the encryption of software, the export of technology, or the permissible uses of intellectual property). Controlling Law. The parties agree the laws of the Federal Republic of Germany will govern this Agreement and all matters arising out of or related to this Agreement. Entire Agreement and Severability. This Agreement, including the Service Plan, as amended from time to time according to its terms, shall constitute the entire agreement between Customer and the Provider respecting the Site, the Web Services, the Support, the Data, and the Third Party Data described herein, and shall supersede all prior agreements, arrangements, representations or promises, whether oral or written, as to its subject matter. This Agreement may be amended only in a written agreement that is duly executed by authorized representatives of the parties. Force Majeure. The Provider and their respective affiliates shall not be deemed to be in default of any provision hereof or be liable for any delay, failure in performance, or interruption of service resulting directly or indirectly from acts of God, civil or military authority, civil disturbance, war, terrorism, strikes, fires, other catastrophes, power or telecommunications failure or any other cause beyond its reasonable control. Assignment. Neither party may assign this Agreement without prior written consent unless in connection with a merger or acquisition of either party. Severability. If any provision of this Agreement (or any portion thereof) shall be invalid, illegal or unenforceable, the validity, legality or enforceability of the remainder of this Agreement shall not in any way be affected or impaired thereby. Individuals that cannot present a validated European VAT ID are considered to be "consumers" and shall not be granted access to this web service. State organizations that cannot present a validated European VAT ID are not considered to be "consumers", but non-consumers.